United States Senator Barbara Mikulski can now add a couple more distinctions to her name, after it was announced today (April 5) that one of the world's largest astronomy archives and an exploding star in space have been named after the veteran politician. The Barbara A. Mikulski Archive for Space Telescopes, or MAST, is a huge database that contains astronomical observations of stars, planets and galaxies from 16 separate NASA space science missions, including the prolific Hubble Space Telescope. "I'm humbled and honored to be recognized by our nation's top scientists and innovators as a fighter for science and research," Mikulski (D-Md.) said in a statement. "I believe in American exceptionalism; not just because we say we are, but because of our investment in innovation. Through innovation, America has led the way in scientific breakthroughs and discoveries, which inspire future scientists, inventors, and entrepreneurs." The special designation was assigned by the Space Telescope Science Institute (STScI) in Baltimore, Md. A huge astronomy archive located at the Space Telescope Science Institute (STScI) in Baltimore, Md. has been named the Barbara A. Mikulski Archive for Space Telescopes (MAST), in honor of the United States Senator from Maryland. In this picture, Senator Mikulski (D-Md.) is in the center, with STScI Director Matt Mountain at her right, and STScI deputy director Kathryn Flanagan at her left. STScI is the science operations center for the Hubble mission. It will also oversee the science operations of Hubble's successor, the James Webb Space Telescope, which is scheduled to launch in 2018. "I am proud to be the namesake of the archive at the Space Telescope Science Institute, which is the enduring legacy of Hubble, and will allow us to peer even further into the origins of the universe after the launch of the James Webb Space Telescope," Mikulski said. Following the announcement, NASA's Chief Scientist Waleed Abdalati issued comments praising Mikulski for her dedication to agency's goals and scientific outreach. "The Space Telescope Science Institute's decision to name its database for Senator Mikulski is an honor very much deserved," Abdalati said in a statement. "She is a tremendous advocate and supporter for science, NASA and the astrophysics community." In addition to the astronomy database, an exploding star in space, called a supernova, is being named in honor of Mikulski. The cosmic explosion was first detected by the Hubble Space Telescope on Jan. 25, 2012. The stellar blast was dubbed Supernova Mikulski by astronomer and Nobel Laureate Adam Riess and his colleagues. The supernova lies 7.4 billion light-years away, and represents the death throes of a star that was more than eight times the mass of the sun. MAST currently encompasses approximately 200 terabytes of data, which is nearly equivalent in size to all the content in the U.S. Library of Congress, according to officials at STScI. The archive contains all of NASA's observations in optical and ultraviolet light taken over the past three decades. Since the early 1970s, a fleet of space telescopes has surveyed the universe across a broad spectrum of energies. Data from groundbreaking missions, such as the alien planet-hunting Kepler Space Telescope, are included in the MAST archive. "Thanks to Hubble and other space observatories, our view of the universe and our place within it has forever been changed," Abdalati said. "We live in an age of extraordinary scientific advancement with astronomy at the forefront. NASA is committed to conducting world-class science from our space observatories, and the data that will be returned from the Barbara A. Mikulski Archive for Space Telescopes are sure to yield many exciting new discoveries." This panel of images reveals a newly discovered exploding star, which has been dubbed Supernova Mikulski, in the faraway galaxy in which it resides. One of the panels also shows its location in the night sky over Baltimore, Md. Observations from the database have already been used to help astronomers discover distant supernovas and alien planets that were not previously detected. "As one of the most widely used astronomical resources in the world, significantly more data is extracted from MAST by researchers than the volume of newly ingested data," Mountain said. "What's more, amateur astronomers and educators are becoming more heavily involved in astronomical research than ever because of the 'democratization' of space via a huge publicly accessible astronomical database like MAST. The consequences are that we are on the cusp of a knowledge explosion in astronomy where discoveries are expanding at an unprecedented rate." 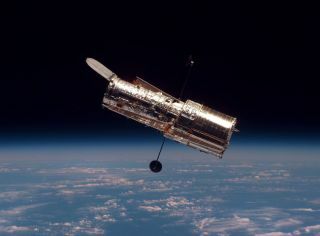 The Hubble Space Telescope was launched into orbit nearly 22 years ago and is responsible for a myriad of scientific discoveries and achievements. The observatory is now in the midst of a three-year project to observe the most distant supernova explosions. "We are in a remarkable period for modern astrophysics research, and it is fitting that Senator Mikulski's persistent championship on behalf of science be permanently recognized by today's events," William Smith, president of the Association of Universities for Research in Astronomy, said in a statement.